I wonder how it feels when you stay all the time on a snow land. 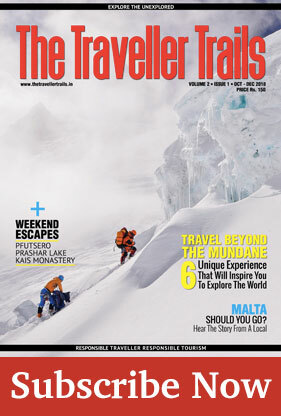 On one winter evening, while I was sitting in the hostel room in Shimla I heard girls screaming in corridors. As soon as I came out of the room and peeked out of the balcony, it was a sudden surprise from Mother Nature. Snowflakes were falling down like the tiny feathers tuning to settle softly. My heart bounced so badly that I couldn’t resist showing out my teeth and started jumping against the door. Jogging my feet, dressed within no seconds, brushed my eyes to more dramatic black and stepped out hopping with an umbrella. It was the excitement of first ever snowfall of my life. There and then I decided to visit Manali to see more of it. Right things are dropped down at perfect timings, either talk about destiny or attitude of nature. Everything was painted in white in Shimla. I was so smitten and desperate to leave the place no matter what, just to see Manali during a heavy snowfall as I heard that Manali is more of fun during snowfall. I asked my friends if they would like to join. At first, they were not ready but finally agreed to see my exciting gestures. 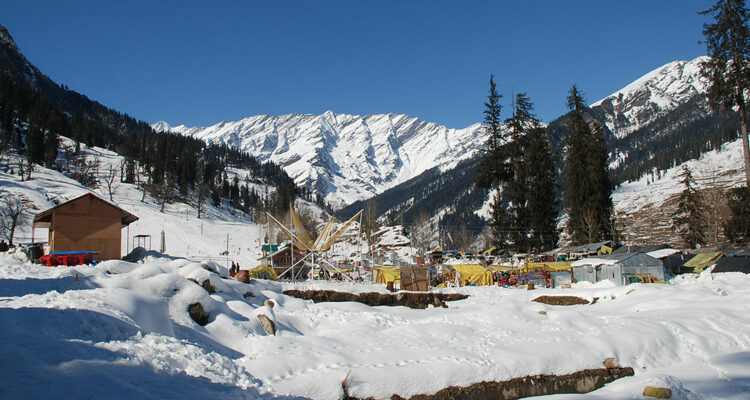 We ran towards our rooms, packed the luggage within minutes and managed to book seats for Manali traveling overnight. Finally, my wolfishness to travel in danger has finally brought me here to Manali. As we were close to Manali the snow has started falling heavily. Everything was so cold and hurtful to touch. We got down the bus, early morning at 4 am and walked straight to the hotel which was close to the Mall. We checked into the rooms and fall on bed draping the sheets over. On waking up found everything around was so bright, white and sparkling. The very first thought that came into our mind was that how every little thing looks covered in snow. Everyone rushed out of the hotel. It felt as if we’ve stepped in a wonderland. The flakes falling on my lashes made me felt so wonderful, comparing to the camera. We were waiting for the roads to be cleared by afternoon so that we can visit the local spots. Fortunately, we got a chance as the weather started clearing. We visited some of the finest temples here including Old Hadimba Temple, Vashisht Temple where we took the bath in hot water springs, Manu Temple in Old Manali and finally the Tibetan Monastery which is close to Mall road. In the evening we explored the shopping locales on mall which has some of the underground markets. 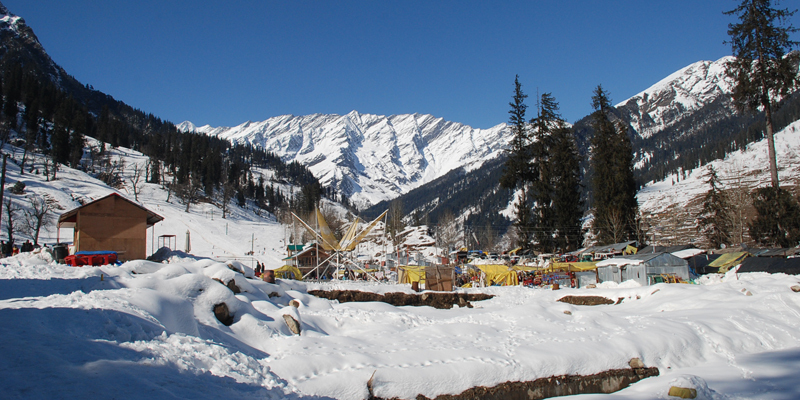 Next day we planned to visit the Solang valley a famous spot for adventure lovers. On reaching here we took some of the finest views of glaciers and snow-capped mountains. The place is a perfect spot for skiing as the valley has some of the finest ski slopes. On our return back to Manali we sipped a cup of hot coffee on Mall as it was extremely cold and had late lunch at famous Chinese restaurant – Chopsticks. Finally, we checked out of the hotel and boarded our bus back to Shimla. On this short trip, I found that every scene has a beauty of its own in the snow. The huge trees and hills close to the sky felt close to heaven, made me visualize that I am a tiny bit walking under the settling nature.